The shop is a new venture from Autumn and Viljo Basso. At a little more than a month old, White Pine Coffee Shoppe already has the vibe some places work years to obtain: comfortable, eclectic, cheery, energetic, versatile — a place where all are welcome. On one recent morning, an older gent in dapper shoes sits in a sage-green upholstered chair reading the paper. Next to him is an empty seat made from a salvaged drum barrel by local maker White's Modern Industrial, which coffee shop owners Autumn and Viljo Basso bought at a recent arts fundraiser. In the center, a Formica table is occupied by a pair of 30-something moms, deep in conversation while their toddlers chase each other excitedly. An older woman stands at the bar-height table, admiring one of several Beastie Boys-themed artworks on the wall. All the while, behind the counter, tattooed shop manager Dan Couillard measures, pours, steams, serves and genially greets. "We wanted something cool next door that would complement the Bluebird," says Autumn Basso, referring to the popular Midtown Bluebird bistro, one of four restaurants the Bassos have owned since 2006. After opening Syringa Sushi, the couple launched Garnet Cafe in 2010 (they sold it three years later, and it continues to be a standing-room-only place on weekends) and the Bluebird in 2016. For White Pine's food menu, the Bassos rely on baker Kayla Carey, who already bakes pastries for their other restaurants. "She just has this infections spirit that is awesome," says Basso. Have biscotti ($1.50) with your Americano ($2.75-$3.25), a muffin ($3) with your chai latte ($3.25-$3.75), crafted locally by Coffee Roboto, or indulge in the "Mocha de Muerte" with espresso, spiced chocolate sauce and steamed milk ($3.75-$4.25). 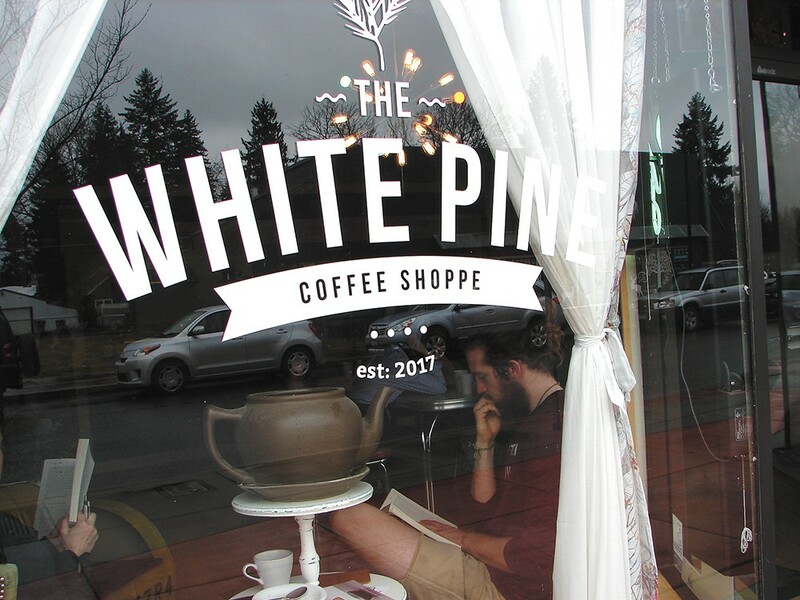 White Pine plans to rotate its coffee selection. Right now, it's using DOMA Coffee and will keep DOMA's Carmela's blend on hand for espressos. The shop also offers as much variety as possible in its brewing methods, from AeroPress ($3) to pour over ($3.50), Chemex ($4) and good ol' French press ($5), the latter of which seems quaintly old-fashioned now. The couple is looking forward to providing a place to highlight local roasters, as well as artists and others in the community, says Basso, who credits the collective restaurants' staff of 35 for making White Pine possible. The original print version of this article was headlined "In the Groove"